Lately there seems to be more awareness of the need for children to have freedom, especially to play in nature, and the growing disconnect between children and nature. There was the Natural Childhood Report, and I’ve come across loads of articles, policy papers and the odd book aimed at showing the malaises that result from this generation’s separation from their environment. I don’t need articles in colour supplements and reports by consortia of NGOs to have angst about my kids getting out to play – I already have it in spades. Today I am fretting over a magazine article in the Guardian. The author appears to have visited hundreds of cultures and tribes in all corners of the planet and observes how free and happy their offspring are in comparison with our own. My children are, as usual, inside. They are playing tickle and fight between games of top-trumps. “Mum….” says my ten your old in the disapproving tone of a Victorian governess, “you really shouldn’t read that kind of thing” and turns back to her card game. We’ve actually made the effort to get out to the middle of nowhere, surrounded by wild nature, sea, mountain moor and woodland, both for our own sanity and so the children can get back to nature exploring, den-building and disappearing for hours on end into the woods. We come here whenever we can, a little But n Ben, 40 minutes walk from the road, brought back to life from a ruin in the 1960s and now co-owned by 5 families. The cottage is tiny, just one room and a sleeping platform, it has no electricity and no proper loo, but there is space and light and freedom (in theory). In practice, however, the rocky shore is still tranquil, the crags of the twisted and mossy hazel woodland behind the cottage remains largely undisturbed, and and the ticks of the heather moorland don’t get to latch onto our kids very often. Unless, of course, we facilitate an activity. The children love coming here, we pack our things into rucksacks and head out over the bog, to this little getaway sandwiched between sea and moor. But the muddy, mossy, wildness seems to lack the attractions of the cottage for the children. And now I am reading about how kids aren’t getting the opportunities to play wild in nature while our own children, surrounded by the stuff, stay indoors. “Why don’t you go and play outside?” I ask again. I explain that all the research says that children are happier when they can play in nature and prod sticks into rotten trees and create sculptures out of cow dung and wallow in mud up to their knees. “We’re happy Mum” they reply. I fail to see how here, in the world’s most idyllic place for kids to discover the outdoors and explore risk and freedom, my kids want to sit on the floor playing hangman. I tell them that in the old days they would have been sent out after breakfast and not allowed back until dinner. This calls for drastic action. I have taken to locking the kids out of the house in Glasgow a couple of times to prevent them and their rampaging friends from making a dash inside from the lane, where they meet to swap things, chalk out hopscotches and build assault courses out of scrap wood and other items thrown out by the residents of our terrace. The strategy is to set off for a walk up the tussoky hill behind the cottage – hard walking for adults, and like finding your way through a boggy maze for children. My hope is that they will choose to play in the woods instead and we get a bit of a walk alone, though never far out of earshot. I lock the door. I suggest they stay and play outside rather than join in the slog. They choose to come with us. I suggest getting sweets when we get back to civilization. They stick to us like limpets. We struck a bargain on the understanding that they would stay away from the house until lunchtime and set off back to the cottage through hazel and birch scrub green with moss. When we reached the short grass of the raised beach we looked back to see our shadows following us from a discreet distance. They skirted the cottage, just out of sight below the berm of shingle and stayed out until they felt it was a respectable time for lunch. According to some of the things I have been reading, children have a much smaller home range than they had 40 years ago. Where once kids ranged freely; the distance they stray from home has declined by 90%. In the city, however, my children seem confident to play independently. Their preferred spot is the back lane, but they love going to the shops alone and walk to school and friend’s houses. They plead to be allowed more rope and, surrounded by roads and cars, the biggest killer of children in the developed world, they yearn to roam free. In contrast, on a camping trip to Tiree last summer, our tent pitched right next to a beach with miles of coastline to explore and no cars, they stayed uncomfortably close. They couldn’t be persuaded to go explore and opted to sit with us while we read and lounged and pursued other, generally boring, activities. Now back at the cottage and with time to reflect, I am developing a theory from my sample size of one. It seems to me that children, familiar with city life and confident of the rules and norms that apply, are nervous of interacting freely with a purely natural environment. Even children like mine that have been exposed to wild places and nature from a young age. City children, familiar with cars and concrete, but alien from their natural roots, may need more help to discover natural places and truly make them their own once again. 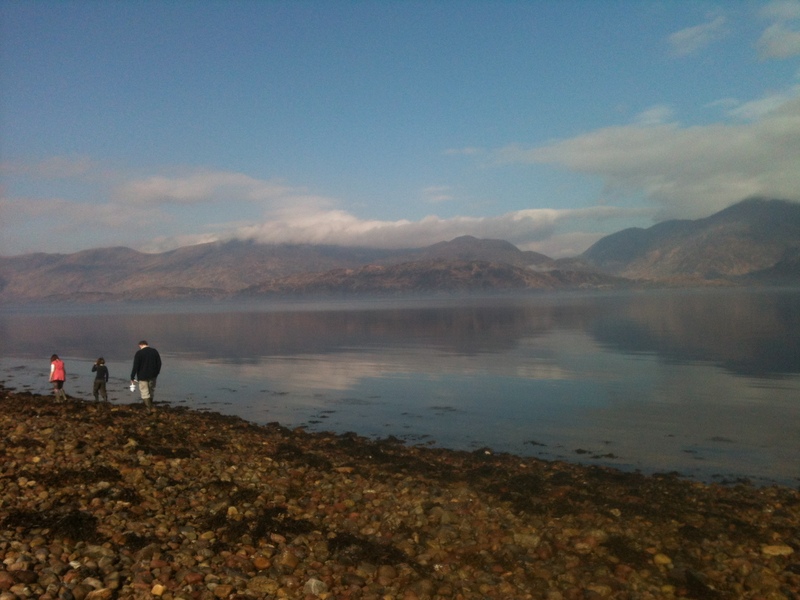 As I was finishing the notes for this essay sitting just outside the cottage, and with a view of Garbh Bheinn the other side of Loch Linnhe, a boy wandered past with a shinty stick. He was hitting a ball, walking to it, picking it up and continuing on. A little later he walked back doing the same thing. In the afternoon, as we carried our rucksacks back to the car at the end of the weekend trip we saw the same boy, this time with a bike, heading across heather moorland pushing the bike determinedly towards the cottage. This time we recognized him as the farmer’s son, going to check on the cows that were ready to calf. We stopped to chat and praised his dedication and independence. He grinned widely and explained that his mother had said that if he didn’t go and check on the cows then he had to do the washing up. A line that I immediately added to the mental armoury of ammunition to get our own kids outside in future. This entry was posted in Miscellaneous, Work and tagged Children, Natural Play, ntural childhood, play, wild play, wilderness by nager. Bookmark the permalink.